Today I wanted to discuss an alternate form of gaming, and point out that the hobby as a whole knows no bounds. Anyone can do it. Anytime. Anywhere. I'll let the picture above entice you in, then talk about it more, after the jump! Pubhammer at 'The Vestry' pub in Epsom Town Centre on Monday nights. Tolworth First Founding, in the hall behind 'Our Lady Immaculate' Catholic Church, on Tuesday evenings. 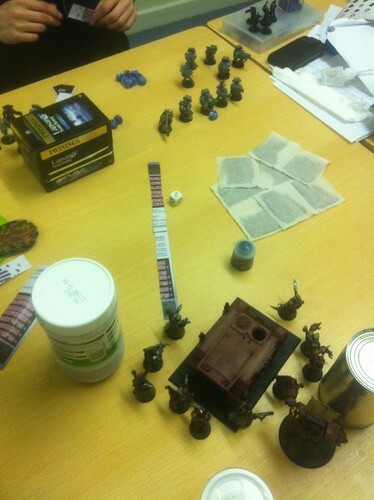 Games Workshop: Epsom runs 'The Exalted: Gaming Nights' on Thursdays in the Hobby Centre. On Fridays, I believe there's yet another club at 'Our Lady Immaculate' run by a local independent stockist. Wowzers. Again with the waxing lyrical. As an aside that's also worth adding now, any of you out there who use Twitter, search now for the hashtag #miniaturemonday, it's a wonderful way to inspire yourself and others. Essentially, every monday, post up a picture of a model (it can be finished or work in progress), maybe add a comment, and add the hashtag #miniaturemonday (I also usually add something like #40k or #warhammer to tag even more). You can then browse for other posts with the tag and see what other people are working on, whilst also getting feedback on your own models! Back to the topic at hand though, because I can still hear the confusion over the title, the opening paragraphs and the photo. On the 10th April, I was sitting on the boat (I used to live on a barge with several other people, but not talking about that now) with Paul, a good friend of mine who's also a big Games Workshop enthusiast. He's also Scottish and one of the best laughs you could ever have. Seriously, I love Paul. We were sitting around rather bored, just talking about hobby, when my phone gets a text. Leif, another friend of mine, a uni student, is bored in his halls of residence as he's alone (it's Easter, after all, and everyone else has gone home). Leif has a small Space Wolf army in the making, but isn't very confident with Warhammer 40,000 yet - though he's an avid Warhammer Fantasy player. 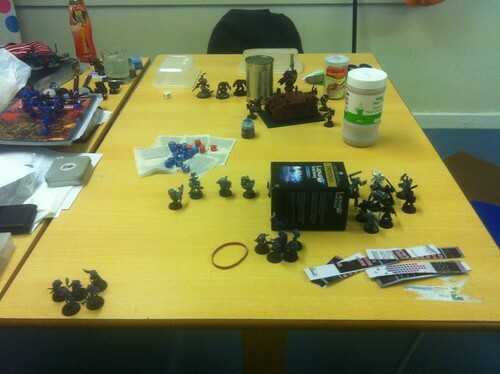 Thus, Paul and I decided we'd cycle down to Leif's and have a game of 40k on his kitchen table - just a small friendly to help him learn the rules and some basic tactics to take with him to the Games Workshop: Kingston Gaming Nights. After a fun-filled cycle ride to Leif's place (involving my shoulder bag losing a strap, and being dragged down the road for about 30ft, trailing Paul's daemon-prince...) we pull up and begin to get out our armies. I pull out my work-in-progress Word Bearer Chaos Space Marines, Leif grabs his Space Wolves and Paul, having fixed his Daemon Prince, cracks open his Chaos Daemon army. "Shall we set up the table then?" I ask. Leif looks at me with a smile, "Sure! What scenery did you guys bring?" The sound of a bell clanging in my head. Scenery. Of course. "Urm, we didn't, but that's ok... we can make some with random bits and pieces!" cries Paul darting around the kitchen and grabbing random objects, "Look, a hot chocolate tower, a take-away container bunker and... uh... a tea-bag swamp!" 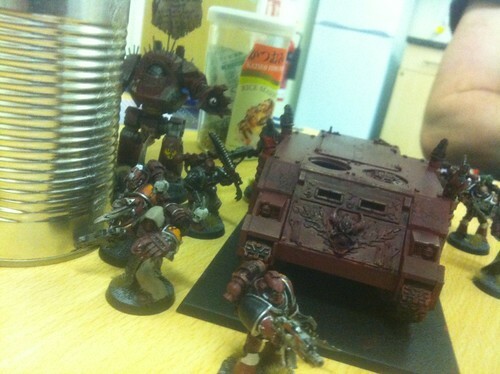 So, we roll-off for deployment, having set up the scenery, and I deploy my Word Bearer force to the southern side, hiding my Contemptor behind a baked bean can, and my Rhino parks behind some rice-seasoning. Leif then deploys his army, and Paul sets about organising his daemons into the army he wants coming down on turn one, and the army he wants in reserve and begins praying that the Chaos Gods agree with him. "Ah," I add, "I think I've left my tape measure behind. Do you have one?" Paul shakes his head, "Mine broke." "I leant mine out to a friend." Leif says solemnly. "But I have Warhammer Cavalry bases! They're 2" long!" exclaims Leif excitedly. 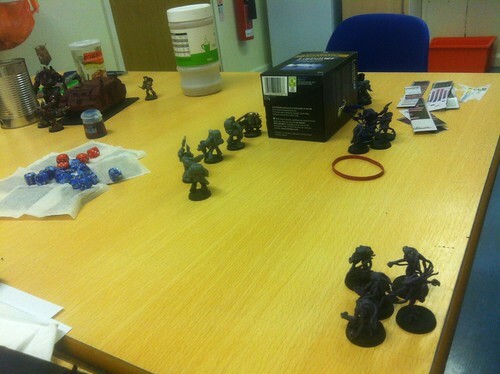 We're all resigned to this being the weirdest game of Warhammer 40,000 ever, by now. "Even better," I add, picking up some flyers for a local night club that are strewn nearby, "These are A5 which I'm pretty sure is..." I measure three of the cavalry bases alongside the flyers, "Yep, these flyers are exactly 6" long! We can use these, cut into strips, as measuring sticks!" "Genius!" Paul cries as he begins cutting flyers into strips. And thus, on went the game, us measuring distances using cut-apart Night Club flyers, hiding behind random condiment packaging and frantically scrambling around the kitchen chasing dice that bounced off the hard wooden table (seriously, you don't appreciate how much force is absorbed by static grass until you spend two hours chasing dice that bounce loudly across the table and onto the floor - and that clatter gets really annoying!). Paul had great fun with nearly all of his units scattering into impassable scenery, enemy units or off the board, resulting in Deep Strike Mishaps (fortuitously, every mishap was a 1 or 2, meaning that the units just came down the next turn instead). This kept Paul staring at the board, but getting to do very little each turn as most of his army flatly refused to turn up to the battle as Leif's Space Wolves and my Word Bearers began tearing into each other in earnest. Eventually, Paul's daemons began showing up and roasting entire units at a time. In the final turn however, it was down to Leif and myself, both of us contesting the single objective in the middle of the board (Paul was miles away from any chance of contesting). At the last charge, my Contemptor dreadnought roared a challenge at some Blood Claws hiding in the tea-bag swamp and charged madly towards them. Had he done enough damage and scattered the Blood Claws, the game would have been mine. Instead, the Contemptor decided to get its foot caught in a tea bag, and immobilised itself (rolling a 1 for the Dangerous Terrain we'd classed the swamp as...). All in all, I think it was the most insane game of Warhammer 40,000 I think any of us had ever played, and we had a fantastic time. We threw the standard rules out the window. None of us had written army lists or bothered to work out how many points each force was worth - we just played it by what looked right. 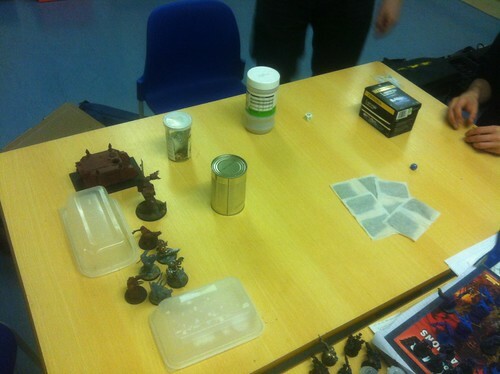 Ultimately, I only had one Troops choice, we were playing on a tiny table with random boxes and tea bags as scenery, and our measurement distances were probably right off most of the time, but, you know what? We had amazing fun, with some really crazy occurrences and wonderfully hilarious lines ("If I were you, as only the plasma guns can harm the Contemptor, I'd hold the other three guys behind the Hot Chocolate to claim cover saves..." - "Haha! Baked beans won't save you now, boy!" - "It would appear the dreadnought has its foot stuck in the tea leaves..."). It just goes to show, in my mind at least, that the most important thing about Warhammer 40,000 isn't playing a hyper competitive "win-at-all-costs" game, it isn't about superbly painted miniatures battling over exciting and cinematic scenery (though that certainly does add something incredibly special to a game) - no, it's about having some crazy fun with some good friends. Don't let lack of scenery or tools stop you playing. Aspire to have that game board we all dream of, but ultimately, the most important thing is to be having fun!